This opportunity was well taken when Indigo worked with Middlesbrough Council to develop a new digital visitor experience at the Tees Transporter Bridge. The small visitor centre is often un-manned and so presenting fragile or valuable exhibits was impractical. However with digital, we were able to create three interactive touchscreen exhibits, one of which is based on the original tender documents and technical drawings of the bridge. These original drawings and documents are housed safely in the Teesside Archives and can be viewed by the public by appointment only. Through digitization however, these fascinating documents are accessible to all, and can be explored as part of an interactive touch screen kiosk allowing users to explore the original scanned blueprints of the bridge and learn how it was constructed. The kiosk also includes a quiz ‘Are you engineer enough?’ which is based on the original tender document. ‘Bridging the World’ is an interactive game that brings to life a previously static exhibition about 18 famous bridges that were designed in Teesside. Indigo’s design team utilized universal bridge-building engineering principles to develop a game that challenges users to solve the puzzle of which bridge to build in which location. Through playing the game, visitors learn key engineering facts such as the reason suspension bridges can have such long spans, and why the unusual solution of the hanging transporter bridge was chosen for Middlesbrough. 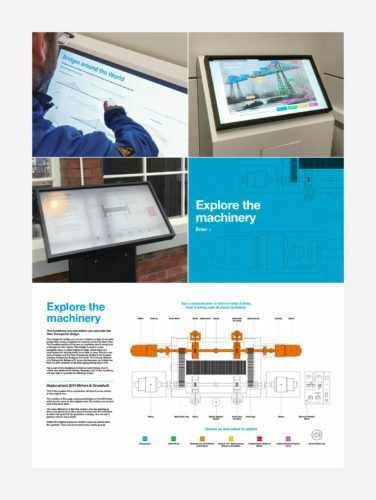 The third touchscreen kiosk we developed for the Tees Transporter Bridge Visitor Experience links to a son et lumière display in the Winding House and Engine Room. Users are able to touch an area of the diagram of the machinery on the screen and light up that machinery and hear a voiceover description of the workings.